Cigar gauge and shapes change from brand to brand, so the following is a guideline of a few common styles. Neither will the shape determine the taste, or strength. Mostly you should pick the size that feels comfortable with you, or the amount of time you have to smoke. Petit Corona - ring gauge of around 40, about 4 ½ inches long. Corona - ring gauge of around 42, about 5 ½ inches long. Churchill - ring gauge of around 48, about 7 inches long. Robusto - ring gauge of around 50, about 5 inches long. Double Corona  ring gauge of around 49, about 7 ½ inches long. Almost all cigars have straight sides and a rounded end, except for these cigars. Pyramid  ring gauge of around 50, and tapered towards the foot, around 6 inches long. Belicoso  ring gauge of around 50, around 5 inches long. Torpedo  ring gauge of around 50, with a bulge in the middle tapering at both ends. Perfecto  Like the torpedo, bulge in the middle, with a rounded instead of pointed end. Cigar wrappers are used by most to choose their favorite, but there are few differences in the different colors. Except for the Maduro. Maduro  very dark brown to black, Means ripe in Spanish, they add distinct flavor. Cigars, like wine, can be looked at as falling into three distinct categories in terms of body, or strength. Light bodied cigars tend to be favored by novice cigar smokers and many female clients. A light bodied cigar will smoke cool, provide nice flavors, usually spicy or creamy, and not taste too much like tobacco. Medium bodied cigars tend to offer the smoker a lot more tobacco flavor with hints of earth, wood, and spice. Full bodied cigars are for the more serious cigar smoker. They, like a big Bordeaux, offer a very robust flavor with lots of earth and wood. 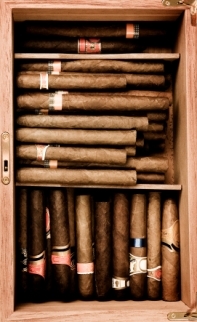 Cigars come in several general categories when it comes to size. Some of the major sizes are Robusto, Panetella, Corona, Churchill, Double Corona, and Pyramid. Cigar lengths are measured in inches and the girth is measured by ring gauge. A ring is 1/64th of an inch. Thus a cigar that has a ring gauge of 32 is ½ inch in diameter.